This best-selling racing wheel is now a 5-in-1, fully programmable device. 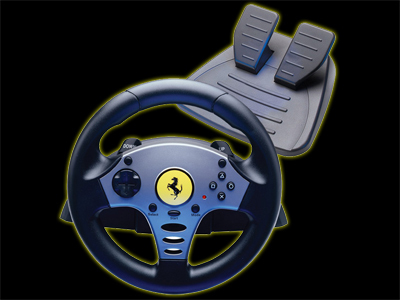 The Universal Challenge Racing Wheel from Thrustmaster is able to be used on PlayStation 3, PlayStation 2, PC, Nintendo Wii, and GameCube gaming platforms. Instead of switching controllers for each system, the Universal Challenge Racing Wheel offers plug and play capabilities with all 5 systems. Ferrari is the icon of automotive competition and victory and has worldwide notoriety - values appreciated by gamers. Key gaming features include:. Self-centering, realistic wheel resistance thanks to the 'bungee cord' system, which also includes an elastic belt offering continous resistance on a wheel's rotation with no points of inflection or interruptions in resistance. This is more realistic and responsive than a spring-based system which provides no resistance in the centre but maximum resistance at the extremities. Includes central clamping system for optimal stability. Mechanical components with recognized results (over 1.5 million units sold). Two Ferrari style on-wheel digital gearshift levers. Central attachment system guarantees optimum stability. Fully programmable racing wheel: all buttons, directional buttons, pedals and levers can be relocated for personal preference. Vibration feature on PS2, GameCube, and Wii compatible games. Progressive pedal set with footrest for ultra precise, comfortable acceleration and braking - ideal for heel and toe racing moves.